KILLINGTON — As July came to a close, Killington Mountain School cyclists were busy in races throughout New England, and from Canada, all the way to Australia! In the 115 KM first stage of Quebec’s Le Tour de l’Abitibi, KMS cyclist Jonah Mead-VanCort finished eighth out of 165 riders. Mead-VanCort finished with the pack, just 17 seconds behind the leaders. L’Abitibi is a UCI (international) Junior stage race for 17-18 year-olds. Some of the best junior riders from all over the world were in Amos, Quebec, competing in the race. Mead-VanCort finished 14th in stage 2 of l’Abitibi, another +/- 115 KM road stage, and he was once again near the front of the peloton. The pack was just 20 seconds behind the day’s stage winner. Well done, Jonah Mead-VanCort. KMS cyclists Ian Clarke and Andrew Borden and KMS cycling alums Brendan Rhim and Ansel Dickey (now riding for the California Giant Pro Team) headed down to Massachusetts to tackle the 2014 Tour of the Hilltowns. The race consists of two laps on a 31-mile course that winds through picturesque towns in the Berkshires. The hilly race begins and ends at Berkshire East Ski Area. Having trained on the hills of Vermont, the KMS athletes were clearly up for the hilly challenge! Clarke rode away from the Cat 3 field to win by over a minute, with the peloton almost three minutes back. Andrew Borden also posted an impressive result, winning a ten-man field sprint in the Cat 4 field to take second. Not to be outdone, riding in the Pro 1/2/3 field, Brendan Rhim took the top spot on the podium, while his teammate Ansel Dickey won the field sprint to take fifth. KMS cyclist and Australia native Noah Barrow competed in the Australian Cyclocross National Championships–that’s right; it is winter and therefore, cyclocross season down under! Competing in the U19 category, 16-year-old Barrow rode away from many older riders to take the fourth place spot! 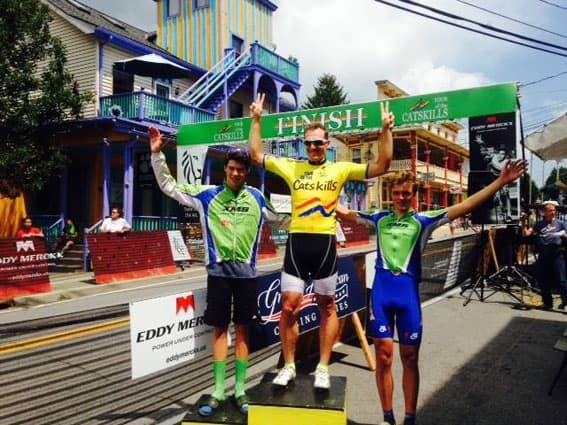 Ian Clarke, Chris Welch, and Jonah Mead-VanCort all took part in the Tour of the Catskills, and all did quite well in this three day tour. The race consists of a 10-mile time trial, 53 mile circuit race (76 for Mead-VanCort, who raced with the Pro/1/2s), and the final stage is a 77-mile (108 for Mead-VanCort) road race culminating on the infamous Devil’s Kitchen Climb. Mead-VanCort had some bad luck in Stage 3, getting caught behind a crash and flatting. However, in a very exciting sprint finish, he was barely edged out by Silber Pro Cycling’s Matteo Dal-Cin to take second place in the second stage circuit race. In the Cat 3 field, Ian took seventh in the TT, 13th in Stage 2 (finishing in the pack with the same time as the leader), and third in Stage 3 to finish second in the GC. On top of that, he wore the climber’s jersey after Stage 2, and finished second in the King of the Mountain competition for the weekend! Similarly, Chris Welch crushed the TT, taking second, finished 16th in Stage 2 (in the pack, same time as leader), and rode to sixth in Stage 3 (while keeping three other riders in check who were trying to bridge up to Ian Clarke). Welch finished the weekend third in the GC, giving KMS two riders on the GC Podium. Meanwhile, down in Concord, N.H., Mikko Aho and Turner Ramsay competed in the New England Criterium Championships. Turner Ramsay rode away from the Junior Women’s field to become the 2014 New England Crit Champion in her age group. She then finished third in the open afternoon sprint competition, which included Pro and Cat 1/2/3/4 women. In the Junior Boys’ division, Mikko Aho also looked great. He rode a smart race, and in an exciting field sprint to the line, he finished third in the New England Crit Championships, just behind and with the same time as the leader!